Asha Aden (‘20), Katie Moon (‘19), Forrest Schrader (‘18), Johanna Beaupre (‘18), Janet Irakunda (‘19), and College Pastor Mike Blair lead attendees in song, talk and prayer. 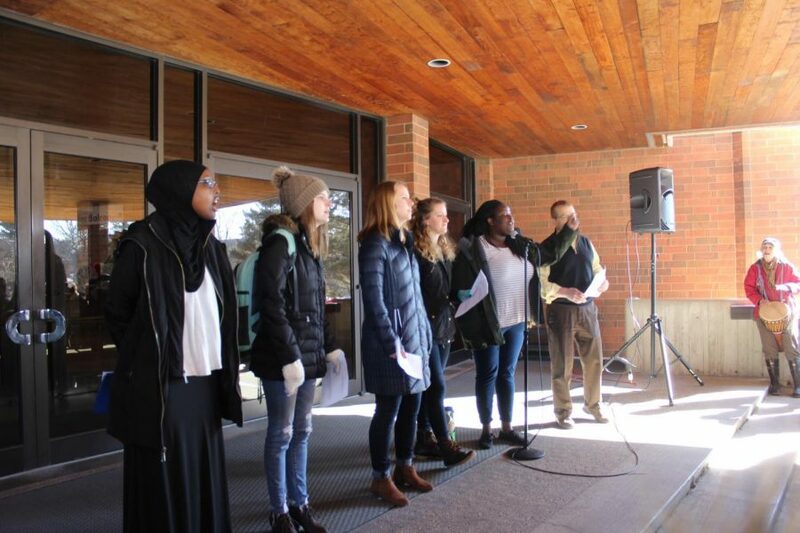 Members of the Luther College community participated in the nationwide walkout to protest political inaction surrounding gun control on March 14. The walkout also served as a time to remember the victims of the shooting at Marjory Stoneman Douglas High School in Parkland, Florida. 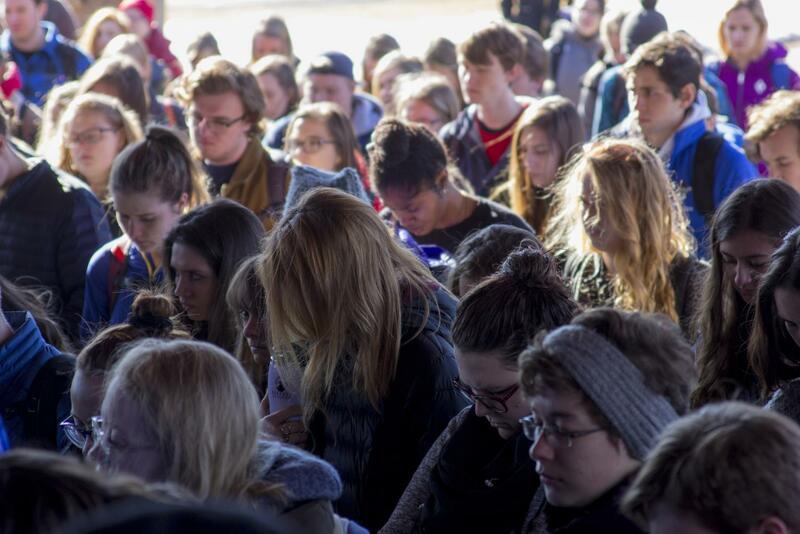 Starting at 10 a.m., members of the Luther community gathered at the steps of the Center for Faith and Life (CFL) for 17 minutes as a symbol to remember the 17 people who were killed in Parkland exactly a month prior. Johanna Beaupre (‘18) was one of the organizers of the walkout. Students join hands during the gathering. The political lobbying power of the National Rifle Association (NRA) was also a focal point of the walkout. While addressing the crowd gathered in front of the CFL, Asha Aden (‘20) pointed to the NRA’s political influence as a reason for the lack of gun control legislation in Congress. The hate symbols that were stomped into the football field at Carlson Stadium was also mentioned at Luther’s walkout. As the protest progressed, Luther students standing in the front of the crowd crossed arms and held hands as a sign of unity. 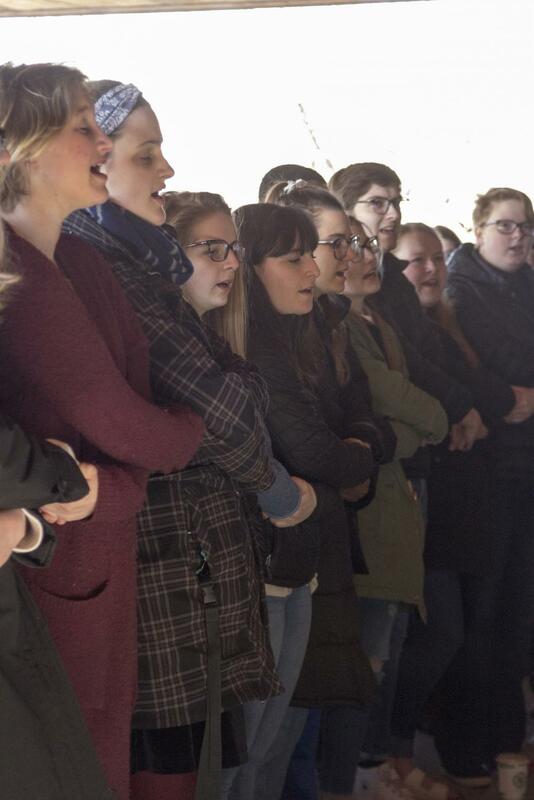 Besides this act of unity by some students, Roets also said that the crowd of people at the CFL provided physical support for the attendees of the walkout. The nationwide walkout was organized exactly a month after the Parkland shooting, so the gun control movement would maintain its momentum. However, some Luther students believed that the gun control movement should have mobilized earlier and had more protests leading up to the national walkout. Additionally, some students saw the walkout as a beneficial way to start discussions surrounding gun control on Luther’s campus. “I think it’s a good stepping stone for further conversations, and it is important to get all views,” Alex Aakre (‘19) said. “Having continuing dialogue or discussions like the [Center for Ethics and Public Engagement] is hosting, that is an important thing to be a part of. If you want to be engaged on the issue you should be aware of all sides”. Aakre added that there gun debate is a complex topic that should be addressed in an intentional manner.